May 8, 2011 May 31, 2012 Nefer Khepri, Ph. D.
Contained within a ribbon-hinged box with a magnetic closure, the Journey Oracle cards rest in a recessed niche with the paperback guide book resting on top. The box is small enough that it can easily fit into a purse and it is nicely laminated to save it from eventual wear and tear. The card backs are decorated with a tree containing a nest with two blue eggs – a very sweet visual homage to the author’s “two eggs,” her daughters. The cards are nicely laminated with colored backgrounds of various colors throughout the deck; including, violet, pink, orange, three shades of green, light blue, burnt orange, etc … This is not a reflection of various suits, but each color works well with the colors within that particular image and helps them all to visually “pop.” Departing from the typical portrait-orientation, four cards are rendered in landscape orientation. As a professional reader and artist I found this to be both interesting and refreshing. Card titles reflect characteristics that strong women have in common (Passion, Hope, Patience, etc …), along with cards reflecting possible weaknesses or sources of inner conflict (Storms, Torn, Confined, etc …). Other cards represent qualities women possess that are also spiritual forces that can help in a particular situation; such as, Appreciation, Hope, Innocence, Independence, Defiance, and Desire. Other cards represent universal archetypes; such as, The Guardian, The Adventurer, The Actress, The Quiet One, The Vampire (as in psychic vampire, not the mythological creature of the night), The Champion, The Messenger, and The Radiant One. Divine energies are represented by The Goddess, Mother Earth, Eve, and The Ancestors. Two cards depart from the formula and do not depict women. Resilience is a tree stump with a single small living branch protruding from the very top with a blue bird perched upon it. Home is a very comforting image of a quaint cottage surrounded by lush trees with a loving Mother Moon gazing down upon the scene and a bird’s nest in the foreground containing two blue eggs representing the author’s children. 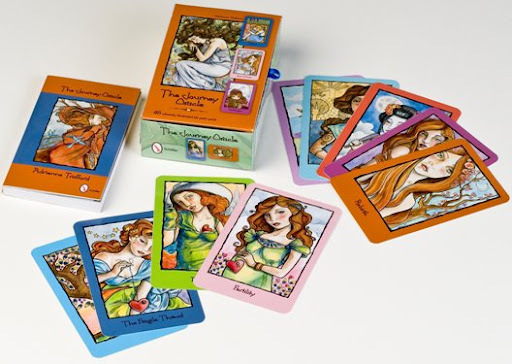 The guide book contains a black and white image of each card on the opposite page from that card’s interpretation, which is divided into two sections: “What the card says” and “What the card means.” The cards for Appreciation and Home include a third section, “Consider this.” The guide book contains no spreads and the author tells the reader that her cards can be used any way we see fit, including standard tarot lay outs. I have done single card draws, 3-card draws, and a few Celtic Cross readings for myself using this deck. It works well with all of these methods. The Celtic Cross readings I gave myself were particularly insightful. Shorter lay outs result in readings that are clear and to the point. A wonderful example of this is a 3-card draw I did regarding my 12-year-old daughter and a teacher who has been giving her problems. My husband has just spoken to the principle and my question was, “How will all this turn out for my daughter?” She had received an F in the class for the previous grading period due to having seven zeros on assignments and the teacher had never informed us she was doing so poorly, plus there were other issues going back to the start of the school year. – Changes: “As we change, we also grow … We can’t change what has already happened, but can only move on and learn from what has happened …” (Guide Book, p. 14). I interpreted this to mean we were correct in going to the principle as our daughter’s well being was at stake, and that changes of a positive nature would occur. Interestingly, in other readings where the teacher appears as a card she is always represented by The Vampire. The day after I did this reading the principle called me to say the teacher will allow our daughter to make up all the zero assignments and after she turns them in the F will be expunged from her record and her grade will be changed. This is most definitely a situation where, although you usually can’t change what has already happened, in our daughter’s case she was being granted a unique opportunity, but we are all moving on having learned a great deal from the experience. This short reading got it right. We were defiant and supported our child by going to the highest authority at the school. Our daughter has remained bright and optimistic despite it all and she truly is The Radiant One, as depicted in this deck. Changes were something that were most definitely needed in the situation. You can see how well The Journey Oracle addressed this issue. It was clear, concise and to the point, not to mention very accurate. Personally, I really enjoy this deck. It has a very nice energy – comforting, nurturing, and reassuring. Colors are bright and vibrant. The cards may stick together a bit while shuffling if you live in a very humid climate as I do, but overall, I’m very happy with the Journey Oracle. This is a deck definitely for the girls due to women being depicted on all but two cards; however, I have used this deck to read for my husband and it gave him two very accurate and helpful readings. The deck may not appeal to male readers, however, it can be used to read for men if you so desire. 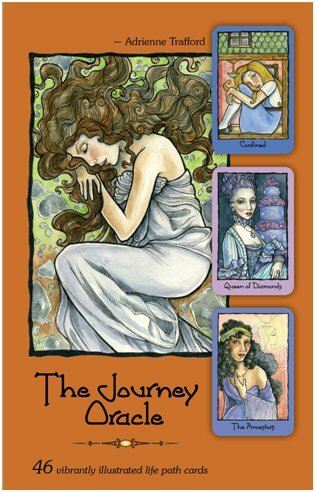 I highly recommend the Journey Oracle, which is high praise indeed as oracle decks and I usually do not get along very well. As a reader I am usually much more comfortable working within the framework of a major arcana and four minor arcana suits. · Packaging, in which Schiffer Publishing has excelled time and time again. For those of us who enjoy adult coloring books (myself included), also available from Schiffer Publishing is a coloring book containing a line drawing of all the cards from The Journey Oracle. This is a unique opportunity to be able to color in the cards from this deck in any way a person sees fit. As an artist myself this idea really appeals to me and I hope that more publishers will follow Schiffer’s example. The title is, “The Journey Coloring Book.” It is in paperback and measures 8½ X 11”. It retails for $9.99 and the ISBN # is: 978-0-7643-3784-0. Previous The Spot Where I Died.